Thuoc Bac street long 328m from Hang Ma street to intersection of Hang Bo – Bat Dan. Almost of this street is the village land of Dong Thanh of Tong Tien Tuc (later renamed the Tong Thuan My) old Tho Xuong district. Terminal street adjacent Hang Bo street of the Nhan Noi village. Selling drugs back then most of the Da Nguu villages to Hanoi do business, they are here and in the Phuc Kien street. Store is quite simple: the baskets containing herbs meters at present living in the house to the ground from the threshold; drugs to whole stems, not cut their roots, tubers not slice, the paper wrapped package of small seeds, we went through this street is the smell of aromatic herbs coming out the back. Drug occupation does not require much funds, the same village usually has a good relationship and do the same job should have a high spirit of mutual assistance; store any buyers that do not have enough drugs in the prescription that is usually get to sale. Street section at the junction between the Hang Mun and Hang Phen street that is a surface area of the old Dong Thanh market, formerly named Hang Vai street better known as Hang Vai Tham – distinguish Hang Vai Nau that is Hang Hang street now. Called Hang Vai Tham but here sold fabric panels that is the small size fabric because that is a small fabric traditional weaving looms, so the only long-suffering 2 span produced by Ke Buoi. Besides selling foreign cloth. This street section is the nature of trade in goods internal to the craft shop owner in the street are few large capitalists, in their home is still the family’s old house small business, with little difference change. But there are other people in the street more money to buy land here into the new building is high, more modern stores to open big. Every cross section from Hang Phen to the end of street , that is to cross Hang Bo – Hang Thiec, formerly known as Hang But. Street section that sells old stuff we found pen and paper and office supplies. Section Thuoc Bac street from the intersection of Lan Ong to Hang Ma before two section of the old Hang Ao and Hang Khoa. That section with name Hang Ao Cu that people trafficking and selling used clothing and blankets and apparel available. Used clothing and apparel that is second in the silk of the garment on the occasion of great joy for guests joined, finished the excess many are sold away. There are also semi-classical opera opera stage clothes, towels adoration for people to dress the people go into trance. That street with name Hang Khoa because there were many lock shop. Key primarily made from several nearby cities to sell or offer the same course by Phung Khoang village craftsmen casting. 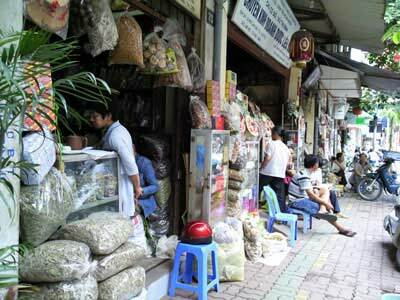 Until people are very fond of western key, simultaneously with the period of major construction in Hanoi, the key seller is turned to the wholesale trade of iron. Wholesale craft iron enrichment to meet many occasions quickly. Today in Thuoc Bac street trafficking remains very busy with all kinds of key items, in-room silver and some building materials of metal. Architecture of the house on the street wearing a modern style, wearing the traditional style. A variety of homes from 65 to 77 bring western-style, only the house number 71 kept the traditional style. Especially with the house number 87 is where the late painter Bui Xuan Phai lived, now titled “Phai’s world” and kept some of his works.